Edit - Extended one more day! Valid today! 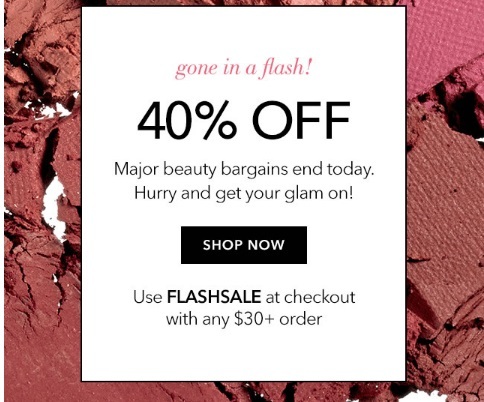 ELF Cosmetics has a Flash Sale today! Save 40% off any $30+ order with the promo code below! Enter the promo code FLASHSALE at checkout. Offer is valid today only. Get Free Shipping if you spend $35 or more after discount. Please note, Free or discounted shipping offers are based on $4.95 Standard US Shipping, Canadian orders will receive $4.95 or other applicable discount off the $7.50 Canadian Standard Shipping cost.